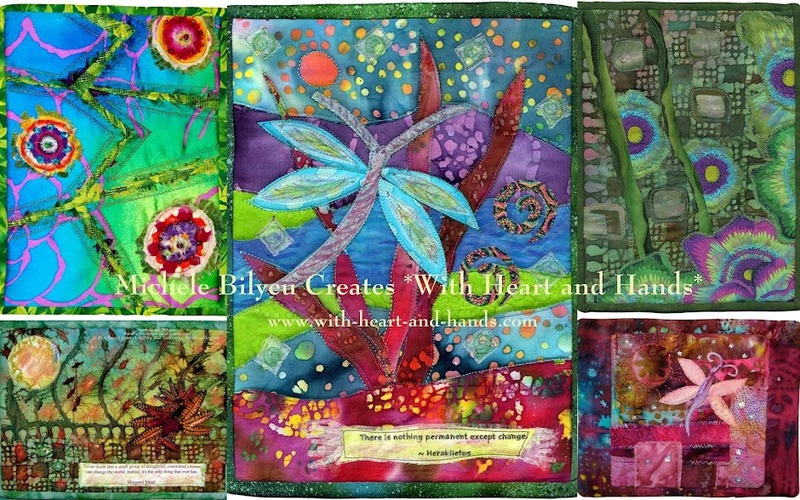 I have so many family members basing chronic illness and life challenging issues, that I am always finding new ways to send my love to them using art textiles, fabric, and stitch. But when I need something I can pop into the mail..when someone isn't feeling well, or needs an emotional boost, out comes one of my "Art Fabric Postcards." Sometimes, they are traditional, and sometimes they are as soft as a little pillow..especially if someone needs to comfort a broken leg, wrist, arm, foot, or heart! I began in the early 2000's when I first learned of them and made and donated them to charitable causes. They were something I could make out of very little fabric, a few hand quilting supplies, and very limited free time. 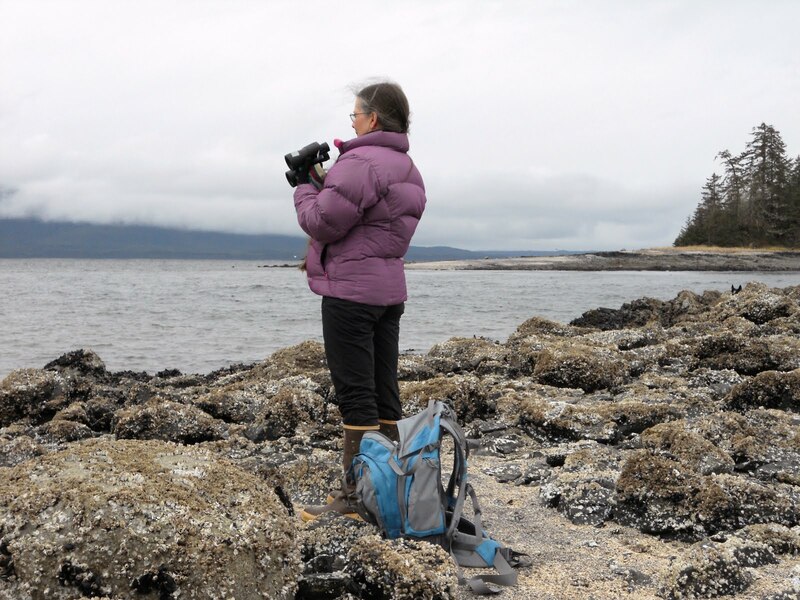 So, it was a given that I sat on my parent's couch in my childhood home on my little island in Alaska and stitched away on any given day. Above, I'd brought with me some tiny 'inchies' inch wide by inch long pieces of quilted fun that are then appliqued onto other pieces of artwork. 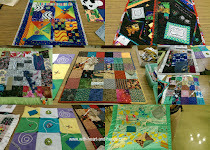 In this case, they became the impetus for a group of six quilted post cards and a donation in honor of my parents to the Alzheimer's Art Quilt Initiative. It was always such a relief to be done with the endless household chores as I attempted to clean out a lovely but definitely 'collector's' home with 60 years of 'valuable memorabilia'. And I have learned to restructure that potential genetic 'inheritance' by creating things to give away, made from things that need to be re-purposed, re-used, and re-cycled! It's so fun and so incredibly easy to make fabric postcards. You can make ones with a pellon or fabric backing that you can stick a stamp on and mail to family and friends or ones with fabric backings that are tiny pieces of art. Sometimes, they are SO much fun, they begin to grow into squares or tiny wall hangings, like these above, and I end up giving them in person or mailing them in manilla mailing envelopes, instead! The little pieces, above, were hand delivered to hospital rooms in Alaska, and in Oregon as I followed my brother and his wife between three states and four hospitals in six months!!!! 1.The minimum card and letter size for US Postal Service mailings is 3-1/2" x 5". Most fabric crafters and quilters simply use the standard measurement of 4" x 6". Once upon a time, it only took one stamp to mail this and you didn't need a wrapping of any kind. You would just bring it to the Post Office to have it hand cancelled and mailed. But to avoid the dreaded roller bar inking of the conveyor belt, you can put on two stamps, hand it over and hope for the best! 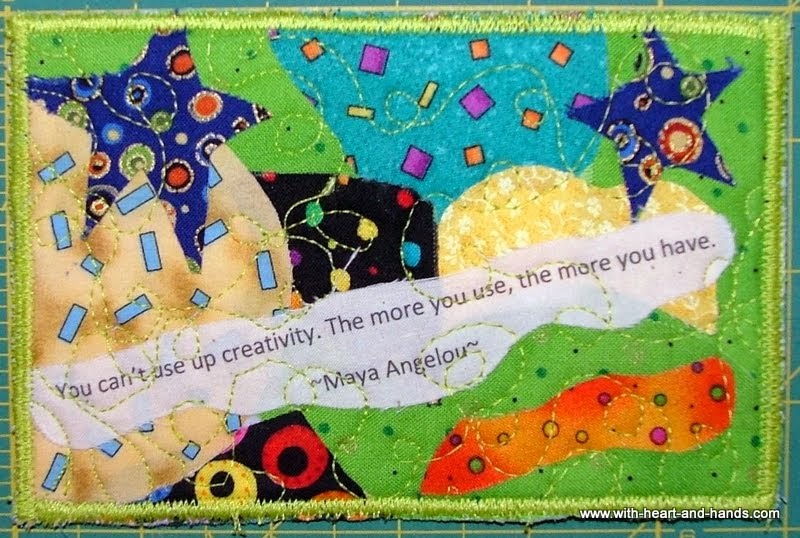 Other wise, use a plastic envelope purchased from a craft store, just for fabric postcards. 2. Keep your fabric postcards 1/8" or less thick to stay within weight limits; cards over 1/4" thick will weigh more and also require an extra fee for their depth...this is where your two stamps come in. If you want 'fancy' art cards with lots of glitz and glamour galore, just pay a little more for the option by having it weighed and correctly stamped. 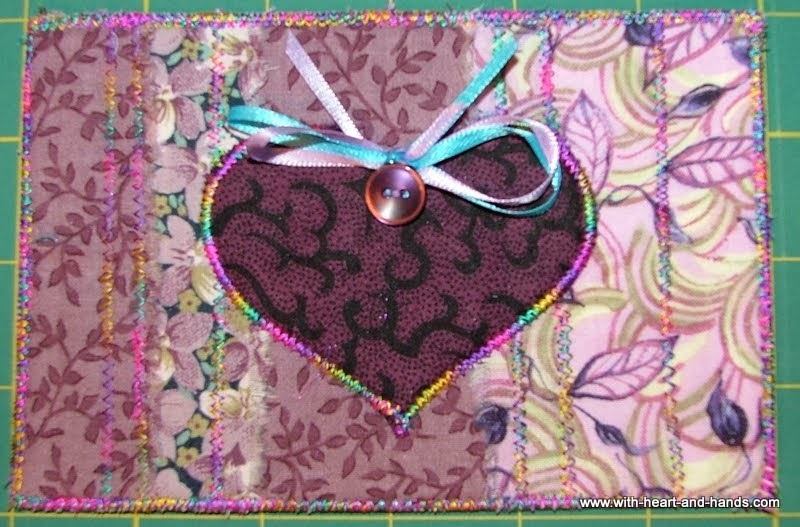 1.Fabric postcards have a top layer, a filling and a back, just like a quilt. If you want to mail it without a wrapping, omit the batting and the pellon or cardstock backing provide the support. 2. Fabric Postcard Fillers can be fast2fuse, pellon, or a medium weight to heavy fusible web or interfacing product. Use the regular weight of fast2fuse for single stamp, no buttons or beads postcards; the heavy version for stability and double stamping. 3. Decorative Elements can include ribbons and buttons, laces and trims or pictures, quotations, or sayings pre-printed on fabric. Scrapbooking departments provide endless ideas, as do yarn and ribbon aisles. Also consider the lovely options of yarn bound edges, or decorative machine threadwork. 6. Use 'Ink Jet' fabric printed photos, quotations, sayings as a focal piece. *Tip: I like to sew my strips directly onto my batting or a piece of foundation fabric. I add my backing at the end as this keeps the entire piece looking clean and neat. 1. 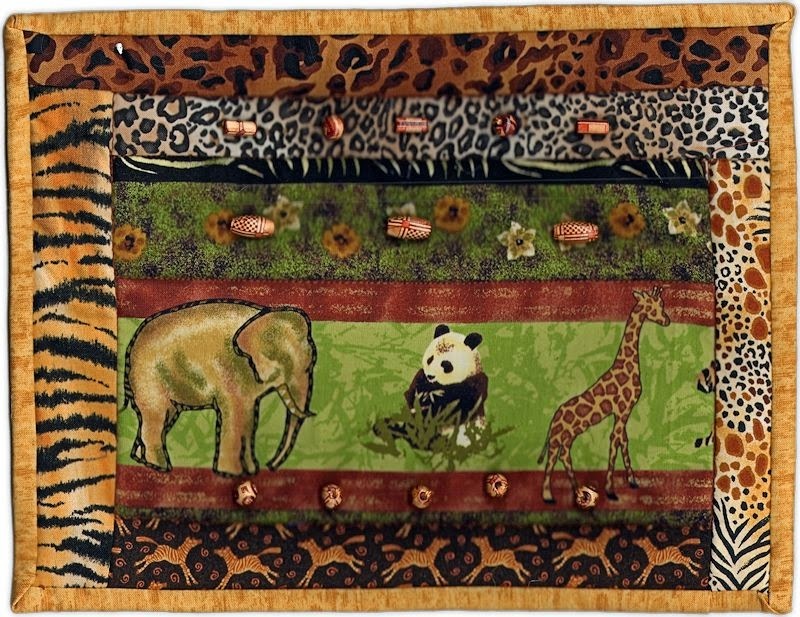 Fussy cut a picture or motif from any fabric.Arrange the cutout right side up on a piece of muslin that's approximately 4-1/2" x 6-1/2", placing it at an angle and slightly off-center. Hold the motif in place with a straight pin or affix it permanently to the muslin with fusible web, or even a dab from a glue stick. 2. Now, randomly cut several strips of fabric that will look good with your motif. Use different widths for best variety and feel free to liberated them by using a bit of wonky 'off kilter' sizing. matching raw edges. Trim the strip so that its width is about the same length as the focal piece's top. Sew together with a 1/4" seam. Flip the strip right side up and press. 4. Now, place a second strip right side down along the bottom of the focal piece, aligning edges and trimming if necessary. Sew together and flip the strip right side up. Press. 5. Continue to add strips to the top and bottom until fabric extends past the top edges of the muslin. 6.Place a strip right side down along one side of the pictorial. The strip should extend past the top and bottom edges of the muslin and should also cover the raw side edges of the top and bottom strings. Sew and flip up. Add additional strips, stopping when fabric stretches just past the side edge of the muslin. Continue to add fabric strips to the other side of the pictorial using the same method. Continue to press flat. 7. Add lace, ribbons, trim and decorative stitches along seam lines or in any other focal area that adds to the charm! Or use decorative embroidery or hand stitching if desired. 8. Add backing fabric, pellon or cardstock "address" piece and stitch edges. You can use a serger, your sewing machine's zigzag stitch, or couch down a decorative piece of yarn along the edges. A nice piece or ribbon can also be used. Fold it in half, encasing the edges..mitering at the corner, or just lay it on top and stitch down after the zigzag enclosure! 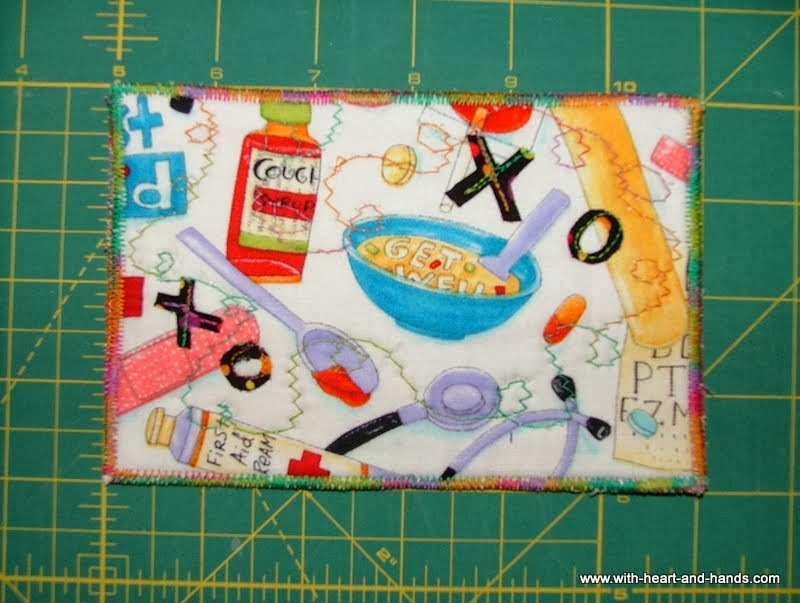 *Tip: This is a great way to use up any pre-fused fabric scraps, if you don't have any, a bit of fusible webbing, a fusible piece of batting, or just a glue stick can be used. 1. Gather up all of your bits and pieces into a nice little scrap pile of choices. 2. Experiment with the creative free play of random bits and pieces until you have a design selection that looks good and feels right! Let your imagination be your guide. 3. Now, press the selections down, if prefused, or lift up a bit of each, and glue down with your glue stick. 4. Random free stitching time! Use decorative machine stitching if you have them or your own creative meandering to add design, color, and additional art stitching. Couch down bits of yard, add ribbons or bows, buttons or bits of jewelry for further detail. Use decorative embroidery or hand stitching if desired. 5. Finish with backing and edge finishing techniques, as detailed above. 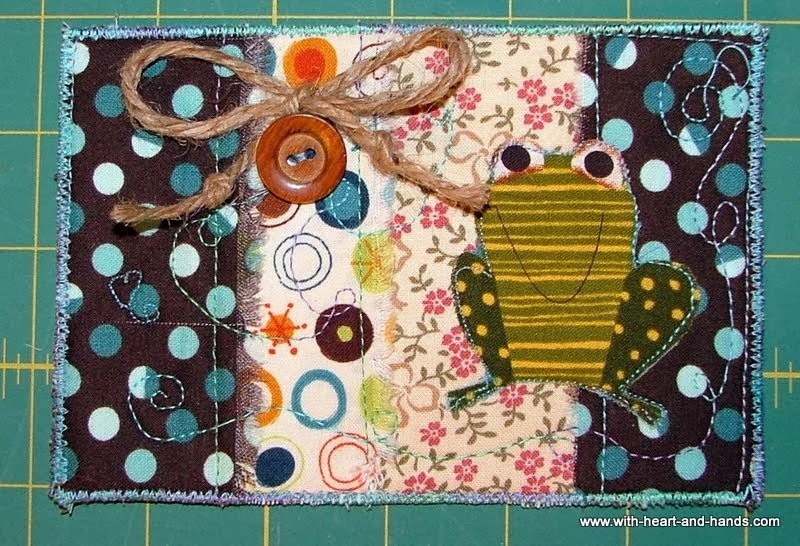 *Trying using a small leftover 'orphan' quilt block or a few leftover strings as shown here. 1. Simply create a random bit of patchwork from something as simple as adjoining squares, triangles, or rectangles, to more complicated pieced stars. Use up those miniature quilt orphan blocks, or perhaps one tiny element as a focal center piece with random patchwork surrounding it. 2. Add additional elements as desired. This includes any batting, interfacing, or backing pieces. Add any decorative buttons or bows, as desired. 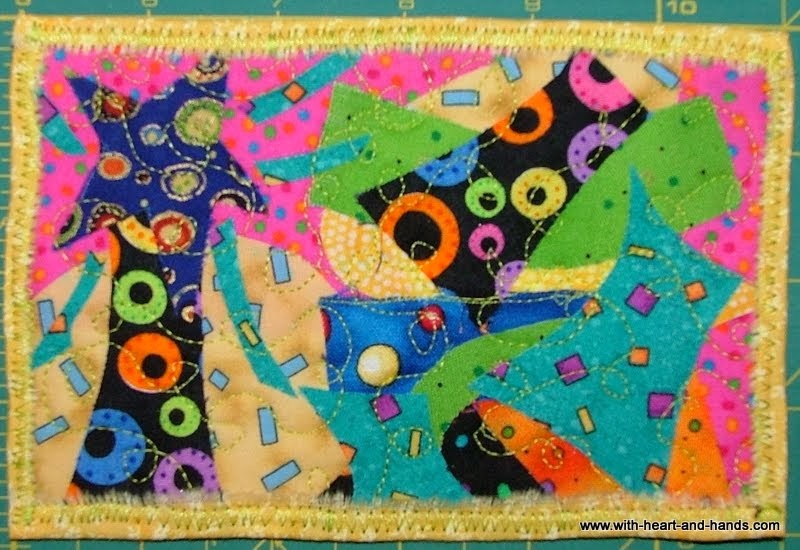 Quilt or free motion stitching, embroidery or hand quilting. 3. Edge finish as above. *Tip: Use a sharp pair of embroidery scissors to fussy cut pieces along hanky or vintage piece edges or cut a series of gentle curves. If you plan on using a fusible element, cut both at once for perfect sizing. 1. Cut out the area of the floral hanky, decorative piece of hand stitching, or a piece of vintage handiwork from a tea or dishtowel, cloth napkin, etc. that you would like to use. 2. I cut a section from the corner of a vintage or treasured handkerchief, making it about 3-1/2" wide and 4" tall to allow for placement options. 3. Cut the background fabrics. You can use one central fabric choice, or several. If using a handkerchief or similar, consider several fabrics picking up colors in the stitchery. 4. Pin, fuse, or glue, if needed. If pieces are fragile, gently pin with small or fine pins or a tiny dab of glue stick along a hidden edge. 5. Stitch by hand or machine, add any additional decorative elements, backing and edge stitching to finish. *Tip: I love to use pre-printed bits and pieces for my focal pieces. Since your fabric postcards will never be washed, you can run fabric through your ink jet printer as described below to create one of a kind art fabric postcards. 2. Using freezer paper or a craft interfacing product, iron a 9"x 12" piece onto a piece of muslin..white or off-white. Make sure it has securely adhered and iron again if necessary. 3. Trim piece into a perfect paper sized piece of fabric/paper that measures 8 1/2 inches by 11 inches. 4. Set printer to a custom setting if desired, or simply try the regular setting. Many work just fine, as is. 5. Align paper/fabric very carefully into paper tray for perfect loading and rolling through and hit print. 6. Using the photo, graphic, set of quotations etc. that you can added to your 'new page' you will now simply click on 'print' and watch the magic of creating your own printed fabric emerge. 7. 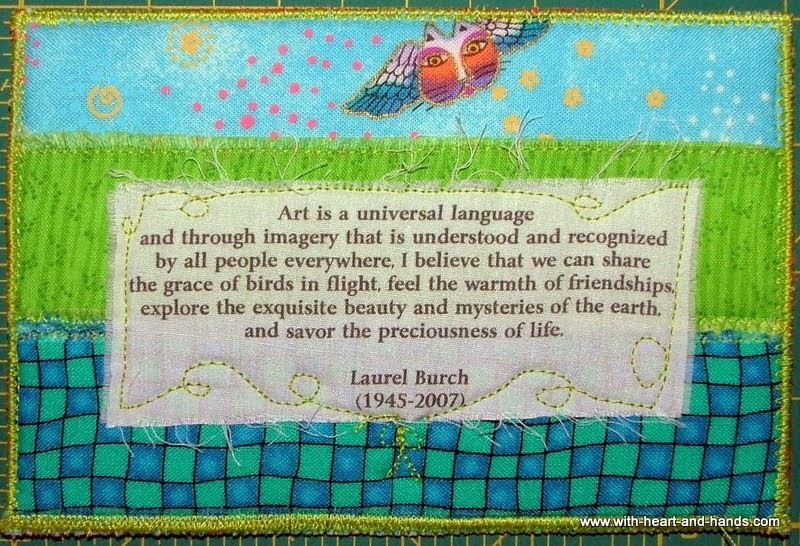 Continue to create the Art Fabric Postcards as above. They are a wonderful, and creative way to make something quickly for someone you care about and let them know that you are thinking of them! Those are the absolute coolest. Love them.